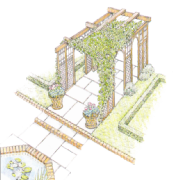 Flowers and colours in your garden all year round articles. Interest through the winter months: Winter is when the rewards for good planning are gained. 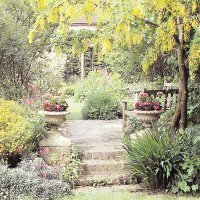 If you target for a third of the plants in your garden to be evergreens proportionally increasing the density as you get closer to your house. It is also a good idea to introduce a number of fragrant plants that flower at different times of the year so there will always be scent and colour in your garden. One of my favourite flowers is Daphne merzereum 'Grandiflora'. They have gorgeous bright purple blooms that appear from February to April and are wonderfully fragrant. Be careful of their berries as they are poisonous. Winter Cheer: The yellow flowers of a winter flowering plant will brighten the the dullest day. 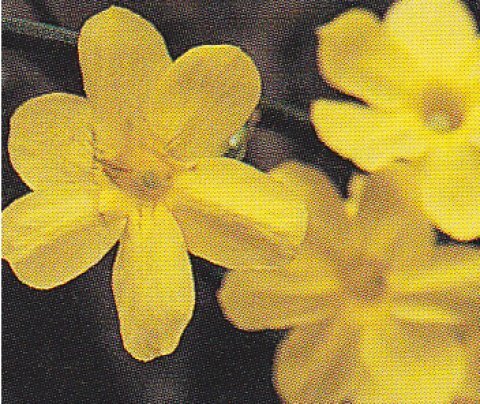 Jasminum nudiflorum, which has no scent, but leaning against a fence or wall looks absolutely charming. Hamamelis, or witch hazel, brings with its bright flowers a lovely scent or there is Chimonanthus praecox which is sweet smelling and also flowers in mid winter. 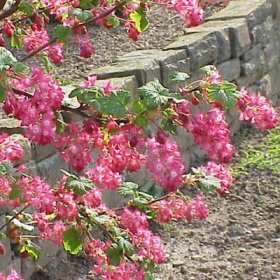 Red & Yellows for Warmth: As spring approaches use Chaenomeles japonica(orange-red) or Ribes sanguineum with its deep rose red to offset the traditional yellow forsythia. Their flowers complement each other beautifully and they will continue through to when your spring bulbs show their heads. 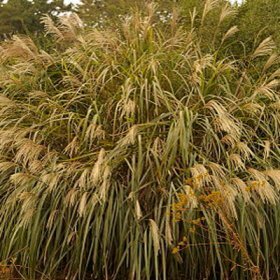 Using Grasses: If you do not disturb your wispy ornamental grasses such as pennisetum, miscanthus and cortaderia, they look beautiful as they twinkle on a cold frosty morning. If you also leave some herbaceous perennials standing their dead stems will protect the dormant plants beneath from frost. Spikes of grasses, dried flower heads on hydrangeas and bergamot with the transparent pods of luneria all add interest to a winter garden. Aster,bergenia,small flowering chrysanthemum,hardy cyclamem,christmas rose,pansy. Aucuba,evergreen bamboo, cineraria, monterey cypress, gynerium,heather,variegated sage,santolina. Malus 'Red sentinel', pernettya, pyracantha. Christmas box, winter sweet, Rhododendron dauricum,winter heath. Elephant'sear, ornamental cabbage,creeping juniper,rosemary,variagated holly. Corsican hellebore, box,lamium,New Zealand daisy,vinca,mountain flax,ivy. Chimonanthus,citrus trees,crocus,daphne,male dogwood,eranthis, garrya, willow,winter aconite. Variegated cherry laurel,blechnum,soft shield fern.